Ganapati Bappa Morya! That is all you would hear if you were currently in the western zones of India, namely, Maharashtra and Goa. This is a special salutation given to Lord Ganesha / Ganapati, our favorite deity. The festivities of Ganesh Chaturti started on thursday 17th Sept 2015 and will carry on for 21 days. Every family worships idol of Ganapati for their preferred number of days which can be 11/2, 5,7,11 or 21 days after which visarjan is done, that is the deity is immersed in a water body like a lake or sea. But from the time that the deity is brought into our homes, celebrations begin. The house and especially the pandal where Ganpati is placed is beautifully decorated. Special foods are cooked only for this occasion. Prayers are done and beautiful songs are sung in the glory of Lord Ganesha. The house is filled with spiritual happiness. Family and friends visit each other and take blessings from all the deities. Celebrations in Goa are more on a homely spiritual scale while in Mumbai, Maharashtra they have a concept of Sarvajanik (which means a group of people organizing it) and more commercial. Both ways of celebrations have their own spirit and beauty. 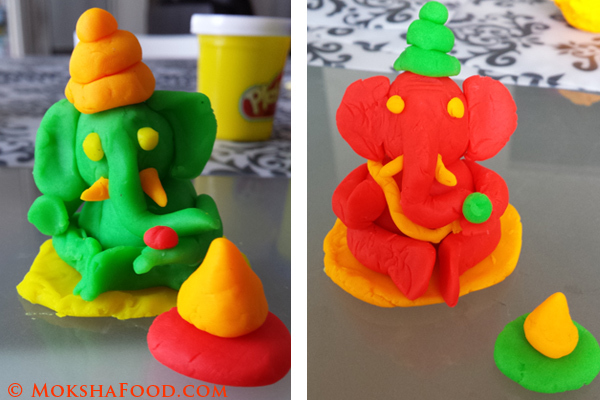 These are playdoh Ganapati idols made by my daughter and I to refresh my childhood memories. Being in Canada, far away from all this makes me miss it all the more. I just did a small puja with my ganapati idol at home and made modaks as prasad/offering. 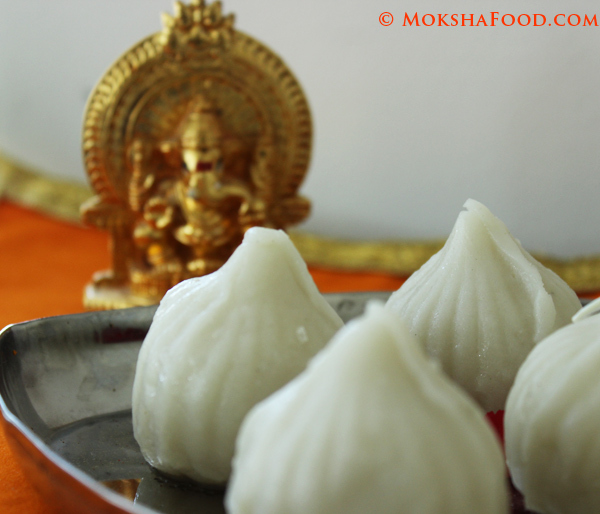 Modaks are Ganapati's favorite food and a must to be made during this festivities. They are gluten free steamed dumplings made out of rice flour and stuffed with coconut, jaggery and cardamom pdr. These melt in your mouth desserts finish off in a blink of an eye. My little on loves the teardrop shape of the modaks. I usually make it by hand but this year mom got me a special mold which made the whole process a breeze. In a saucepan, heat up 1 cup of water till it starts boiling. Add salt, oil and rice flour and quickly mix it well. The rice flour should absorb all the water. Cover and keep aside to cool. Heat another saucepan to medium. Add the grated coconut and jaggery. Saute well till the jaggery melts and forms a uniform mixture with the coconut. Stir in the cardamom pdr and take off the heat and let it cool. Once the dough is warm enough to touch, remove it in a bowl and knead it well. Add a few more drops of oil to make kneading easier. Divide the dough into 8-10 small balls. 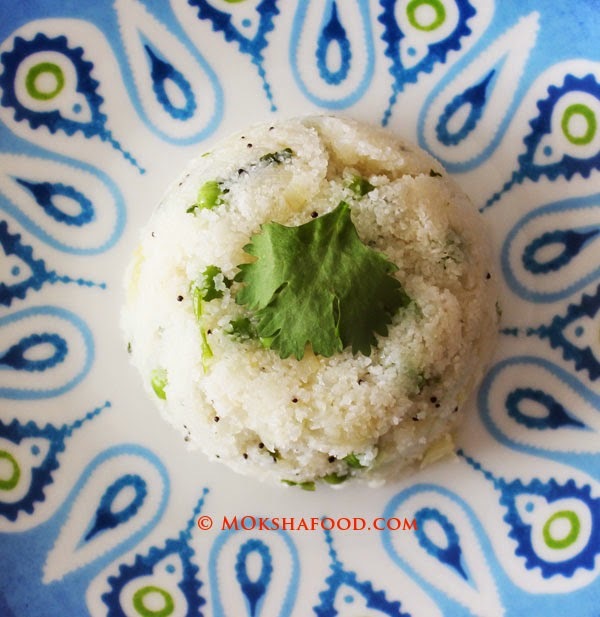 You need to flatten the rice dough ball by hand to make a small disc. Place a tbsp. of filling on it. Carefully pull together all the side of the disc to form a teardrop shape. Grease the mold well with oil. Place the rice ball inside the mold and hold together. Remove the excess which seeps out from the sides of the mold. From the bottom opening, remove some of the dough from the center to create a cavity. Make sure there enough dough left behind to coat the sides of the mold. Add the filling inside the cavity. Use a part of the dough removed from the mold and make a small disc. Use this disc to seal the base of the mold. 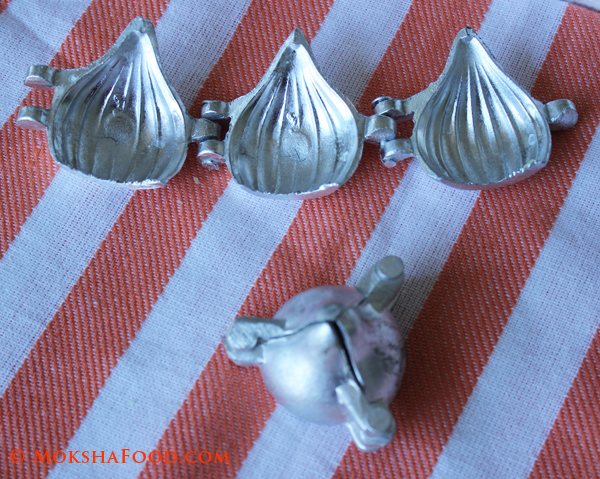 Open up the mold and the modak is ready. 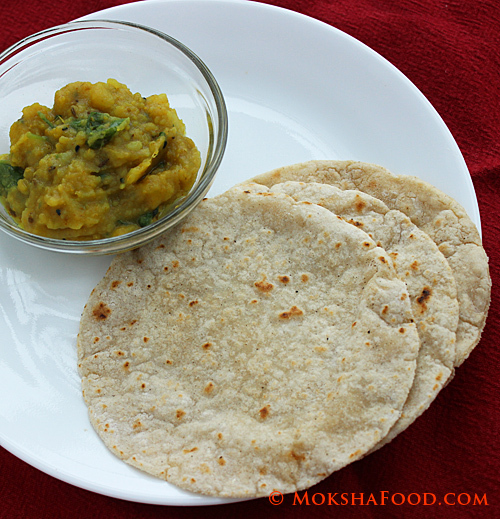 The prepared modaks are then steamed for 10-15 mins. 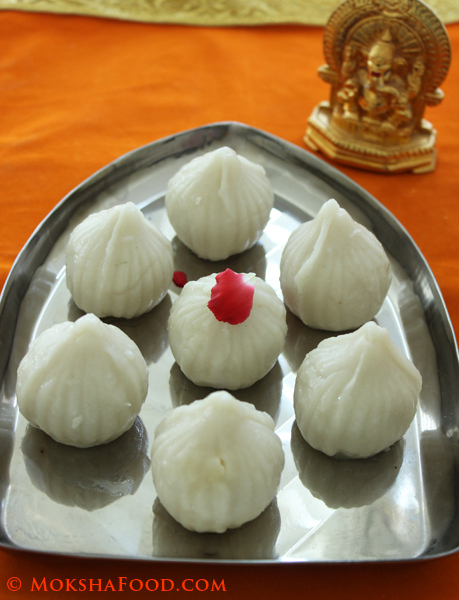 Hot melt in your mouth modaks are first offered to Lord Ganesha and then we all partake it as his blessings. We usually offer 5 or 7 or 11 or 21 modaks. Note: For a first timer, it will be hard to get the tear drop shape. 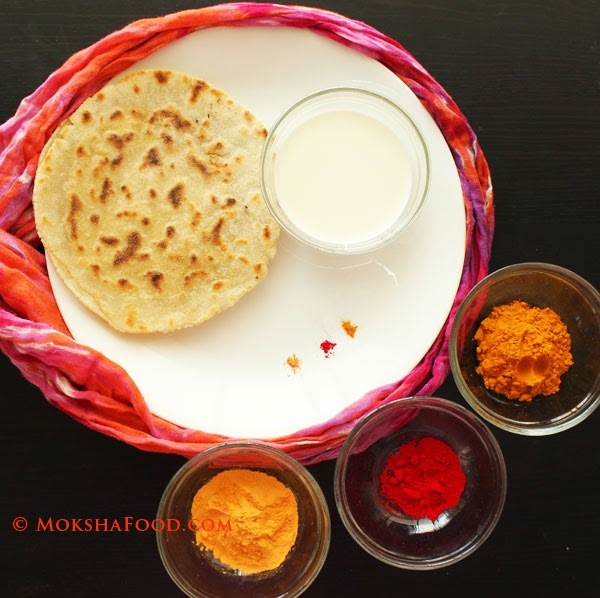 You can make modaks in a round or oval shape too. They taste great anyways.